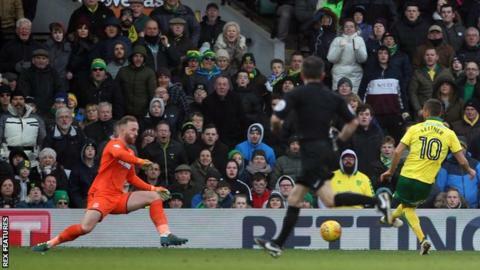 Norwich boss Daniel Farke was sent to the stands in the 96th minute as the Canaries were held to a goalless draw by relegation-threatened Bolton. Farke was dismissed for kicking the ball away after Moritz Leitner had been penalised for a foul throw. Earlier, James Maddison curled a shot against the post and set the tone for a first-half dominated by the hosts. Ben Alnwick also foiled Maddison and Nelson Oliveira, while Leitner sent Norwich's best chance wide. The goalless draw saw Farke's side extend their unbeaten run to six matches, but sharing the spoils with the Trotters - after draws with leaders Wolves, neighbours Ipswich and highflying Derby in their previous three games - saw them slip to 14th in the table. Farke's late show of frustration summed up the hosts' afternoon against a resilient Bolton side, who are 19th in the table, four points clear of the bottom three. While Maddison went closest to opening the scoring with an early effort off the base of the post, Leitner was guilty of the worst miss of the first half - the German sidefooted well wide of the target with only Alnwick to beat. Alnwick may not have been worked in that instance, but he kept the visitors in the contest with a save from Maddison before a diving effort to deny Oliviera. Bolton rarely threatened in response, with an acrobatic effort from Sammy Ameobi - following up a blocked shot from Darren Pratley - the best the Championship strugglers could produce in the first 45 minutes. They looked more lively after the break, but failed to seriously trouble the hosts, who themselves only managed to create a series of half-chances in the second half. "I was angry that a lot of Bolton time-wasting went unpunished and then the linesman somehow spotted a foul throw from 30 metres away. "All I can do now is apologise for my actions and ensure everyone that it won't happen again. "It is unbelievable that we didn't win that game. I thought it was probably our best home performance of the season." "That was a proper shift from the lads. "We were put under a lot of pressure in the first half because they were finding a lot of space but he had a word about that at half-time and adapted really well in the second half. "We had an important win against Sunderland in midweek and it's great that we have backed that up with a point today." Match ends, Norwich City 0, Bolton Wanderers 0. Second Half ends, Norwich City 0, Bolton Wanderers 0. Corner, Bolton Wanderers. Conceded by Jamal Lewis. Offside, Norwich City. Nélson Oliveira tries a through ball, but Dennis Srbeny is caught offside. Attempt missed. Josh Murphy (Norwich City) right footed shot from outside the box misses to the left. Assisted by James Maddison with a headed pass following a set piece situation. Jon Flanagan (Bolton Wanderers) is shown the yellow card for a bad foul. Foul by Jon Flanagan (Bolton Wanderers). Antonee Robinson (Bolton Wanderers) wins a free kick in the defensive half. Aaron Wilbraham (Bolton Wanderers) wins a free kick in the defensive half. Corner, Norwich City. Conceded by Dorian Dervite. Offside, Norwich City. Wes Hoolahan tries a through ball, but Jamal Lewis is caught offside. Attempt missed. Aaron Wilbraham (Bolton Wanderers) right footed shot from outside the box is high and wide to the right. Assisted by Jon Flanagan. Foul by Filipe Morais (Bolton Wanderers). Substitution, Bolton Wanderers. Derik replaces Reece Burke because of an injury. Substitution, Norwich City. Wes Hoolahan replaces Alexander Tettey. Delay in match Reece Burke (Bolton Wanderers) because of an injury. Offside, Norwich City. Moritz Leitner tries a through ball, but Nélson Oliveira is caught offside. Attempt blocked. Harrison Reed (Norwich City) left footed shot from the centre of the box is blocked. Substitution, Norwich City. Dennis Srbeny replaces Onel Hernández. Reece Burke (Bolton Wanderers) is shown the yellow card for a bad foul. Foul by Reece Burke (Bolton Wanderers). Attempt blocked. Aaron Wilbraham (Bolton Wanderers) right footed shot from the centre of the box is blocked. Assisted by Filipe Morais with a cross.